A UNESCO World Heritage Site, Panama’s Coiba National Park is renowned for its biodiversity on land and in the sea. The 500 square kilometer Pacific island of Coiba is the largest in Central America and has had relatively little human impact for centuries. Most of the densely forested island has never been logged and the park’s marine life is protected from industrial fishing. Coibita Island, also known as Ranchería, is part of the park and is home to a small field station in the midst of these incredible ecosystems. Separated from the mainland by rising seas at the end of the last Ice Age, Coiba Island is a real-time experiment in evolution — large species of animals grow smaller, smaller ones larger, and many undergo some sort of change due to the “island effect.” Teeming with crocodiles, scarlet macaws and old growth forest, the little-studied terrestrial ecosystem is a scientific frontier. With extensive reef systems, healthy shark populations and migrant cetaceans, the waters around Coiba are a treasure of the Eastern Tropical Pacific. Research on Coiba has included inventories of flora and fauna, bioprospecting, and the genetics and behavior or crocodiles. Coiba Island’s last known indigenous inhabitants left the island in the mid-1500s, perhaps captured as slaves by Spanish conquistadors. The island was essentially uninhabited until 1919, when a prison colony was established on part of the island. The prison closed in 2004 and Coiba National Park was created by the Panamanian government. A year later, it became a UNESCO World Heritage Site. In 1998, Coibita, a small island that is part of the park, was bequeathed to the Smithsonian Tropical Research Institute for the establishment of a research station. Scientists interested in doing STRI-affiliated work at Coiba should contact our scientific affairs manager. The station currently has limited resources beyond a rustic dorm and camping space. The station on Coibita consists of three rooms containing 22 beds, two bathrooms and a fully equipped kitchen. There is solar powered electricity, a back-up generator and running water. Currently all research supplies including boats, diving gear and field gear and tools must be transported in from the mainland. 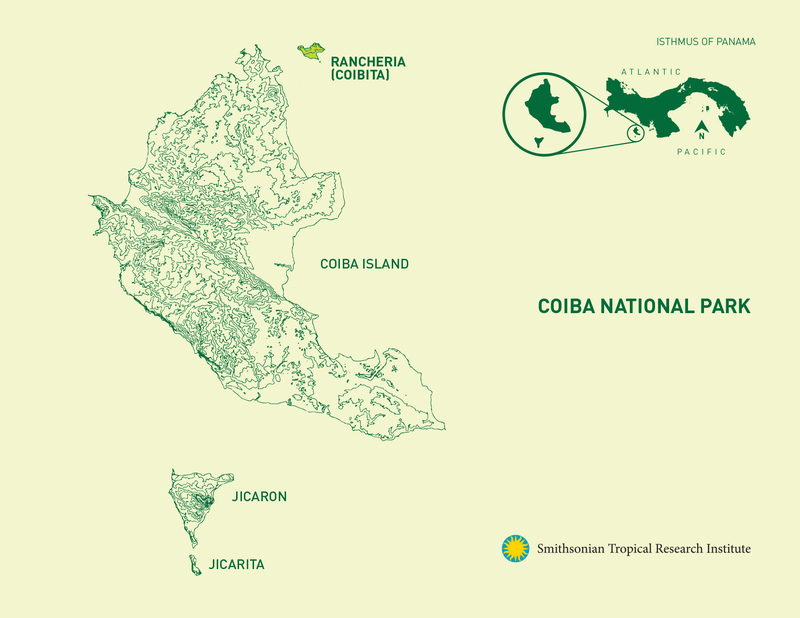 Coiba National Park is west of Panama’s Azuero Peninsula. Access is generally by boat from Santa Catalina or Pixvae. Coibita has an elevated open area that is suitable for helicopter landings.